Tony Hsieh is an amazing guy with an amazing vision who has surrounded himself with really amazing people. If you have any interest in how a business should be run please read this book. The way Zappos functions really is how I believe a company should be run, not just retail business but all businesses. It can change the way you think at a very deep level and make you very unhappy with the way things are being run by almost every other business out there. I am so impressed by this book that I am visiting the Zappos offices in June to get a first hand look at what the cult of Zappos is really like. 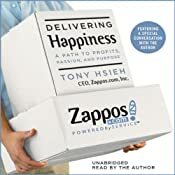 In this, his first audiobook, Tony Hsieh – the widely admired CEO of Zappos, the online shoe retailer – explains how he created a unique culture and commitment to service that aims to improve the lives of employees, customers, vendors, and backers. Using anecdotes and stories from his own life experiences, and from other companies, Hsieh provides concrete ways that companies can achieve unprecedented success. Even better, he shows how creating happiness and record results go hand-in-hand. I rate this book an 8 out of 10 and recommend it to anyone interested in books about corporate culture and how to treat customers. This book popped up in my Audible recommendations and it intrigued me. Written by a former FBI agent with business professor and psychologist Marvin Karlins the book is like a quick guide to reading people’s body language. I enjoyed the contents of this book and do recommend it for everyone, not just business people and card players, but if the book was properly edited it wouldn’t be much more than a pamphlet. The audiobook is 7 hours and 24 minutes long and I think it would be about 2 and a half hours long if all the useless repetition and rambling was removed. That would make it a much better book. The narrator, Paul Costanzo, turned in an absolutely terrible performance. His voice sounded a lot like a computer voice in an underpowered gadget with lousy speakers. It does not sound like he had ever read the material before reading it for the recording. It appears that this is a common problem for him and I will be actively avoiding any books that he is involved in. He says that’s his best offer. Is it? She says she agrees. Does she? The interview went great – or did it? He said he’d never do it again. But he did. Listen to this book and send your nonverbal intelligence soaring. 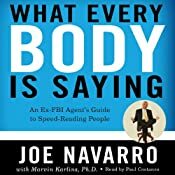 Joe Navarro, a former FBI counterintelligence officer and a recognized expert on nonverbal behavior, explains how to “speed-read” people: decode sentiments and behaviors, avoid hidden pitfalls, and look for deceptive behaviors. You’ll also learn how your body language can influence what your boss, family, friends, and strangers think of you. I rate the book a 6 out of 10 for content and the performance of the audiobook a ZERO out of 10. I listened to this audiobook narrated by Roy Dotrice while commuting and working out. Wow, these books are long, this one is 47 hours and 40 minutes! That is almost 2 full days of audio. According to Amazon the paperback is 1216 pages long. I wont go into any details about the story because I don’t want to spoil anything and if you have not read the second book I recommend you don’t read the publisher’s summary below. I am still enjoying these books and overall found this one riveting. I caught myself parked in the driveway listening to it a little longer each night when I got home or to work. Good stuff. But as opposing forces maneuver for the final titanic showdown, an army of barbaric wildlings arrives from the outermost line of civilization. In their vanguard is a horde of mythical Others, a supernatural army of the living dead whose animated corpses are unstoppable. As the future of the land hangs in the balance, no one will rest until the Seven Kingdoms have exploded in a veritable storm of swords…. ©2000 George R.R. Martin, (P)2004 Books On Tape, Inc., published in arrangement with Random House Audio Group, a division of Random House, Inc. I rate this book an 8 out of 10 and a must read if you have read the first two Song of Ice and Fire books. I listened to this audiobook from Audible while commuting and working out. I love me some Google. I use Gmail as my only email, I use Google Voice as my main phone number, I use Google search exclusively, I love Google Maps and use it almost daily, I use Google Earth to geotag my photographs, and I watch videos on YouTube almost every day. I think this book does a great job teaching us about how Google thinks as a company and how its founders see the purpose and direction of the company. I also think the book is a very honest look into Google, it exposes many of the rough spots the company has experienced in more detail than many of us know. I do not like the way the book was written, it does not follow a single timeline but instead chooses to devote each chapter to a different topic and restarting the timeline at the beginning of the topic covered. And because the topics do not begin an end within the same time period I felt confused about when things were happening in relation to each other throughout most of the book. On the other hand, Steven Levy is an amazing writer with a great voice, each chapter can stand on its own and maybe should have. This edition of In the Plex includes an exclusive interview with Google’s Marissa Mayer, one of the company’s earliest hires and most visible executives, as well as the youngest woman to ever make Fortune’s “50 Most Powerful Women in Business” list. She provides a high-level insider’s perspective on the company’s life story, its unique hiring practices, its new social networking initiative, and more. I rate this book a 6 out 10 and recommend it to any techie that is interested in Google and its leaders.